As far back as I can remember, my parents had a huge lemon tree in their backyard. The tree itself was quite big, but the lemons in particular were huge. It was a "Eureka" lemon tree - and those lemons tend to have super thick rinds. 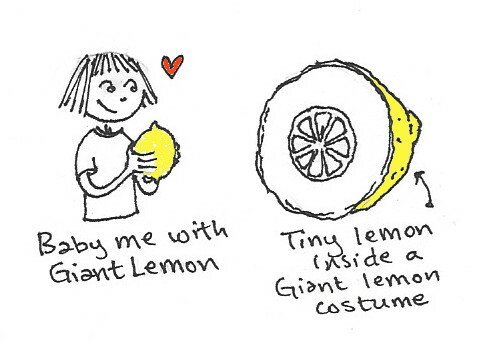 So, the lemons would look enormous, but inside there was just lots of lemon rind and normal sized lemon in the middle of all that rind. The tree was right outside their kitchen window, and all year long we could look out the window to see the beautiful green leaves and the bright yellow lemons. It made us all so happy. 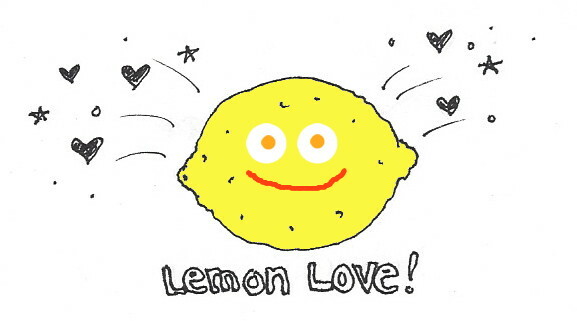 Sometimes when my mom would be cooking dinner, she would ask one of us to run out to the lemon tree and pick out a lemon for her. This was such a silly little thing, but I remember loving it. I wasn't so enthusiastic when she asked me to clean my room or take out the trash. If you've ever had a lemon tree, you know that often a lemon tree will have more lemons on it than you could possibly use. And if you've ever been a kid during summer time, you know that you will often have more time on your hands than you know what to do with. At least, that's how it was in the 70's before kids were small professionals going from one appointment to the next. We were wild and unscheduled and free. Authentic picture from 1979, with my brother, my cousin, and me in the back. Check out our awesome duds! I think Lisa's shirt has a rainbow and a unicorn, my brother has some groovy stripes, and I - of course - am wearing a Snoopy shirt! Such good fashion sense. With all that time on our hands, occasionally our young minds would get it together to put up a lemonade stand. It was usually my brother and me and a few other kids from the neighborhood. With the help of my mom, we would juice up a bunch of lemons, mix in a bunch of sugar, make a sign, and set up shop in the front yard. Our parents live on a street near the downtown, so there is a fair amount of car and pedestrian traffic. I have such a strong memory of watching all those cars driving by and being completely confused about why no one was stopping to buy our lemonade. Didn't they have endless time on their hands? Weren't they just dying for some lemonade? Weren't they eager for social interactions with unknown children?? Ha ha. Now that I am an adult, I understand. 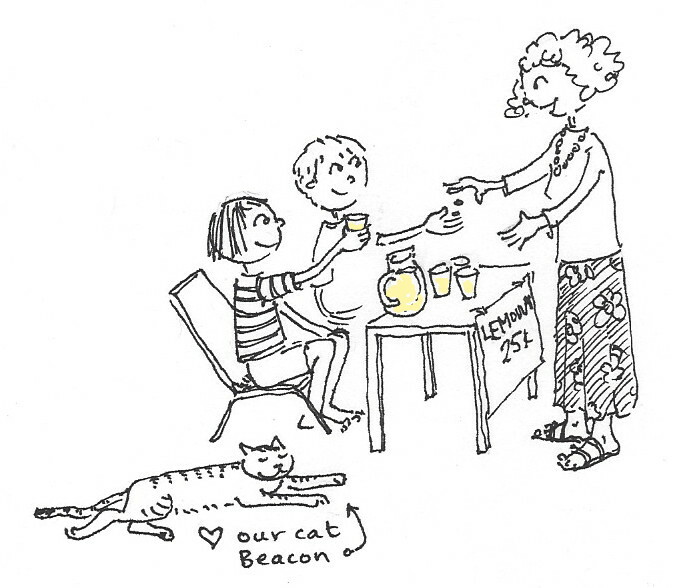 But, we would inevitably get a few passers-by, or even an occasional driver, to stop and try our precious lemonade. It was such an innocent and fun thing to do with each other and with our neighborhood pals ~ and I'm sure our parents were delighted that it kept us busy and out of the house for a good couple of hours. Every once in a while, I'll still see kids out selling lemonade or fruit from their garden, and if I'm not too busy, I try to stop and be an enthusiastic customer... just to keep the spirit alive. A few years ago, my parents' hot water heater burst and the hot water burnt the roots of the lemon tree, and it died. They were quite sad to see it go, and promptly planted a new one. It takes a few years for a fruit tree to pick up steam, but as far as I know, they've got plenty of lemons now. And I've got a lemon tree of my own too... As soon as we moved into our house, I planted a dwarf lemon tree right by our front door. 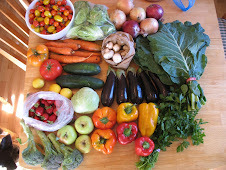 It's beautiful and productive and I love it. I used lemons from my own tree for today's lemonade ... though my own supply is running low until the next wave of lemons comes along. Sometime soon, I hope! Love the sign your brother is holding; "ade" is added to the end of LEMON! Lemonade here is a clear, fizzy, sweet drink, like Sprite, which I hate. But I love this traditional lemonade! Whenever I travel over there I will always gravitate to lemonade,, I love all the different flavours! Rosemary lemonade (from Cafe Flora in Seattle) and Hibiscus lemonade (from Banditas in Vancouver) are my favourite flavours so far! In recent years we've moved on to using our copious lemon supply to make limoncello -- lemonade for grownups! Simple process (lemon juice, zest, sugar and alcohol, plus time;) fantastic results! Your doodles are the cutest! You look exactly the same! I love how you're licking your lips. It looks like it should be a commercial from the 70's! I tried having a Kool-Aid stand as a kid, but I didn't have much luck since there weren't any other houses on our street, and we didn't get any foot traffic. I envy your ability to be able to go outside and pick a lemon for dinner. That is a dream of mine for sure to someday have a house with a lemon tree! This past summer I bought lemonade from four young girls outside their parents laundromat. It cost a buck - tasted great - and they were raising the money for the local animal shelter. It melted my heart. That picture is the most adorable thing! I love the idea of kids doing lemonade stands... I don't think we have a UK equivalent. Aww. 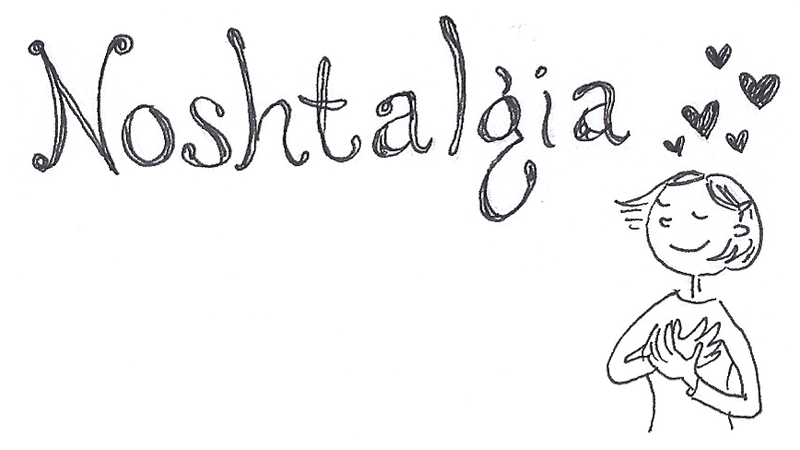 I love the Noshtalgia posts too. 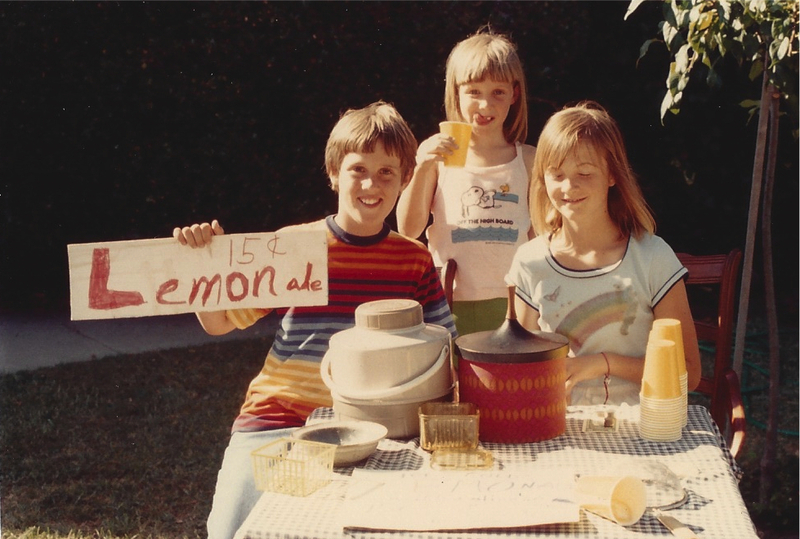 What a sweet picture of you three with the lemonade stand! 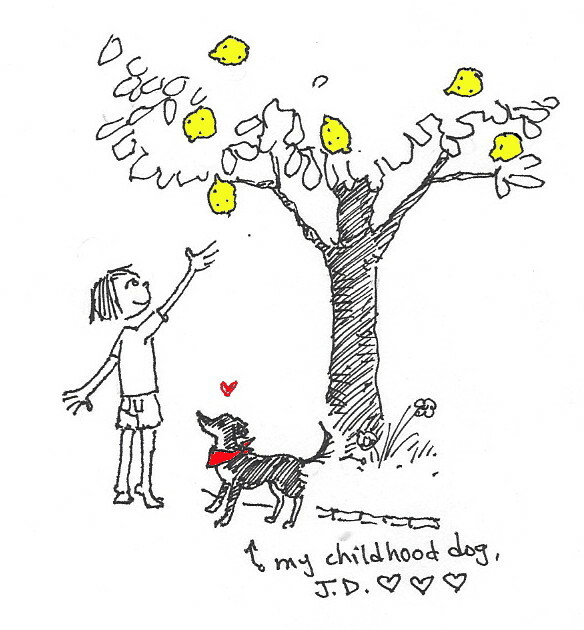 It made me smile to read that you still remember getting to pick lemons from childhood fondly! That's a task that is highly coveted (among the kids) at my house. Our tree is also a bit picked out right now and we're all anxiously awaiting the next wave of lemony goodness.